Prepare the pound cake as per the instructions on the box. Begin by placing a small piece of cake in the bottom of the shot glass. Cover with a layer of whipped cream and set one raspberry on top. Continue with another piece of cake and finish with a portion of whipped cream. Serve immediately. If you would like to serve larger portions, try using martini glasses. In a wedding, it's the small details that make a good impression. This raspberry bagatelle will help you achieve just that. It's a delicioso dessert with a beautiful presentation that's easy to prepare. 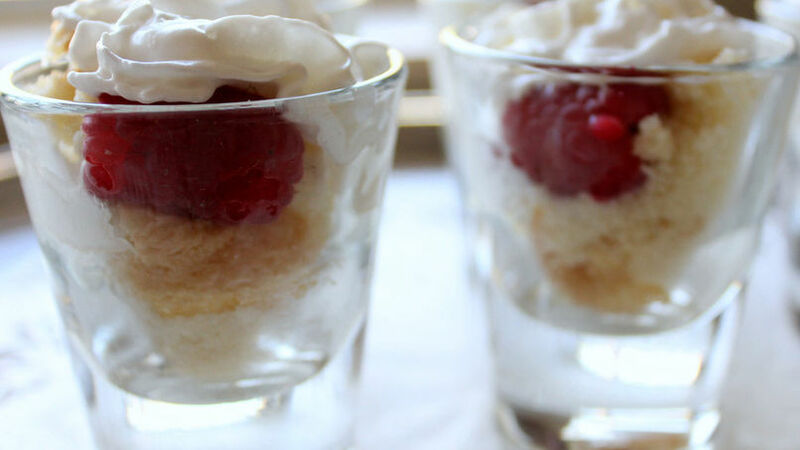 The secret to this special postre, besides the flavor, is the presentation–the layered effect can be shown off in tequila or liqueur glasses for an elegant touch to any meal.